It took us at least an hour and a half to get inside the Duomo. Security measures were pretty tight and there was an awfully long queue outside the cathedral. Soldiers in combat fatigues with machine guns were patrolling the streets and guarding the Duomo, one of Milan’s most famous landmarks. Every visitor was searched and had to have his bags checked. We even had to take a sip of our water, to prove that our bottles did not contain explosives. But it was all worth it. The Duomo is a fascinating building, choc-full of interesting art. 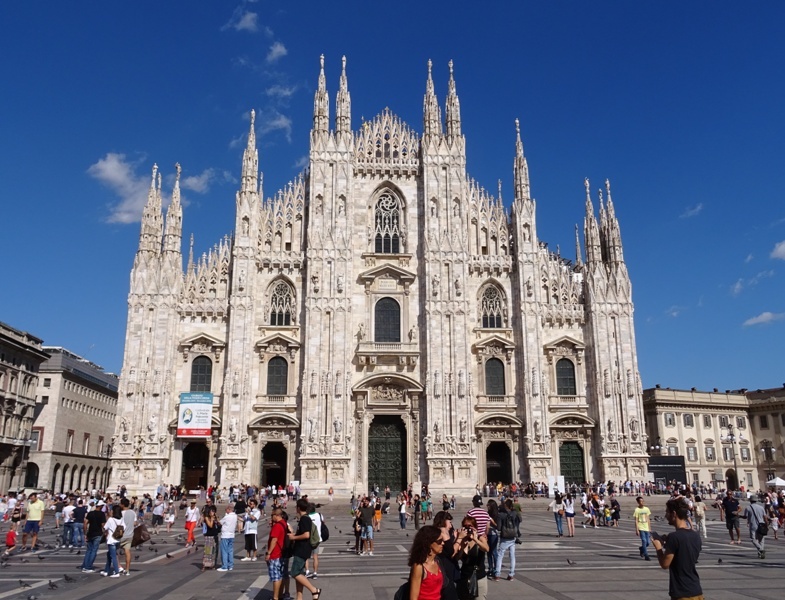 Milan in the Middle Ages was a special city: it had two cathedrals instead of one. The Santa Thecla was the summer cathedral while during the winter, liturgical services were held in the Santa Maria Maggiore. At the end of the fourteenth century, the decision was taken to build a new cathedral, dedicated to the Birth of Mary (Santa Maria Nascente). Construction of the new Duomo started in 1386. The project was initiated by the archbishop of Milan, Antonio da Saluzzo (died 1401). Gian Galeazzo Visconti (1351-1402), who was ruler of Milan and became its first Duke in 1395, also played an important role. 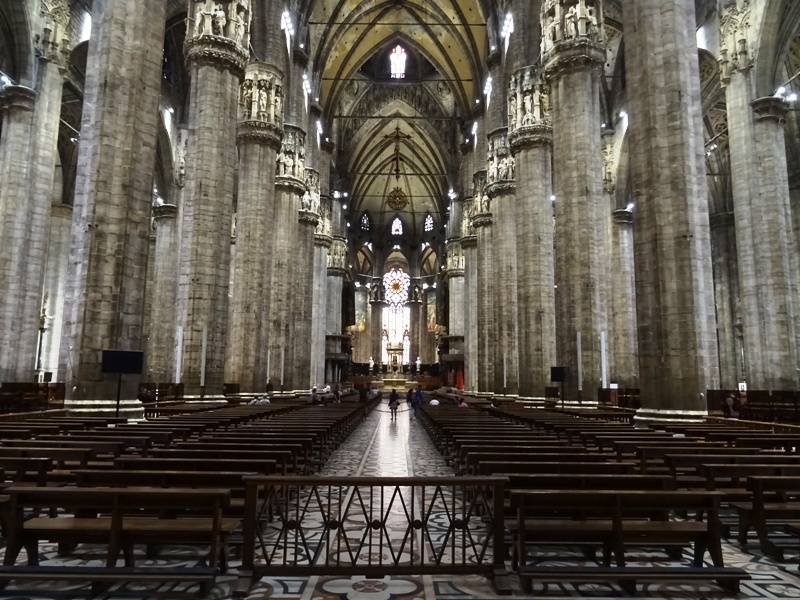 Visconti founded the Veneranda Fabbrica del Duomo di Milano in 1387 to coordinate the construction of the Duomo and decreed that it was to be built in Candoglia marble rather than in brick. Architects and engineers from Lombardy, Germany and France were employed to create a grand cathedral in the Gothic style. The Lombard engineer Simone da Orsenigo was to be the first chief architect, and many more would hold that position after him. Plaque commemorating the founding of the Duomo. Work seems to have gone quite well initially. A jubilee was called for the year 1390, and this brought in plenty of cash. The old basilicas were gradually demolished as work on the new cathedral progressed. The high altar was consecrated by Pope Martinus V (1417-1431) in 1418. Portions of the nave and the aisles had by that time been completed. The fact that the last parts of the Santa Thecla were demolished in 1461 suggests that the Duomo could be used for services around that time. But then the project seems to have slowed down, partly because of a lack of funds. In 1564, Carlo Borromeo – who would later be canonised – became archbishop of Milan. He would hold that position until his death in 1584. As regards the Duomo, his most important decision was the appointment of Pellegrino Tibaldi (1527-1596) as chief architect of the cathedral in 1567. By now the Gothic style was seen as old-fashioned and no longer popular. Tibaldi was ordered to give the cathedral a Counter-Reformation makeover. One of Tibaldi’s most important accomplishments was the rebuilding of the sanctuary. In 1638, Carlo Buzzi from Varese (ca. 1585-1658) became the new chief architect, replacing Francesco Maria Richini (1584-1658). Richini had already done some work on the facade and rather surprisingly, Buzzi decided that the rest of the facade was to be continued in the Gothic style, which had previously been ditched. 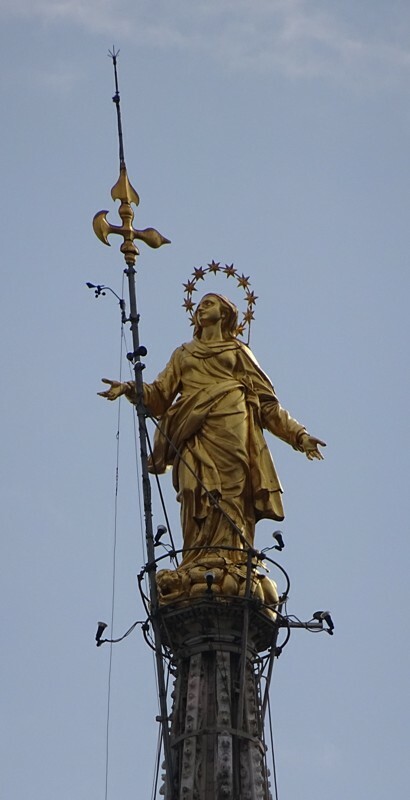 Another important year was 1774, when a gilded statue of the Virgin Mary was placed on top of the highest spire of the cathedral. The Milanese call it La Madonnina. The statue was designed by the sculptor Giuseppe Perego and the copper plating was done by the goldsmith Giuseppe Bini. The Madonnina is some four metres high and stands at a height of 108.5 metres. Napoleon Bonaparte had been crowned Emperor of the French on 2 December 1804 and now wanted to be crowned King of Italy as well. He chose the Duomo as the location for the coronation ceremony, but was unhappy about the fact that the facade was still incomplete after more than four centuries. The job to complete it was given to Giuseppe Zanoia (1752-1817) and Carlo Amati (1776-1852). They finished the facade in 1813. Now more spires were added, as well as statues and the beautiful stained-glass windows in the apse, a project that continued until 1858. Even though the cathedral could by now be considered more or less complete, construction and restoration activities would continue until well into the twentieth century. All in all, construction of the Duomo has taken more than five centuries. 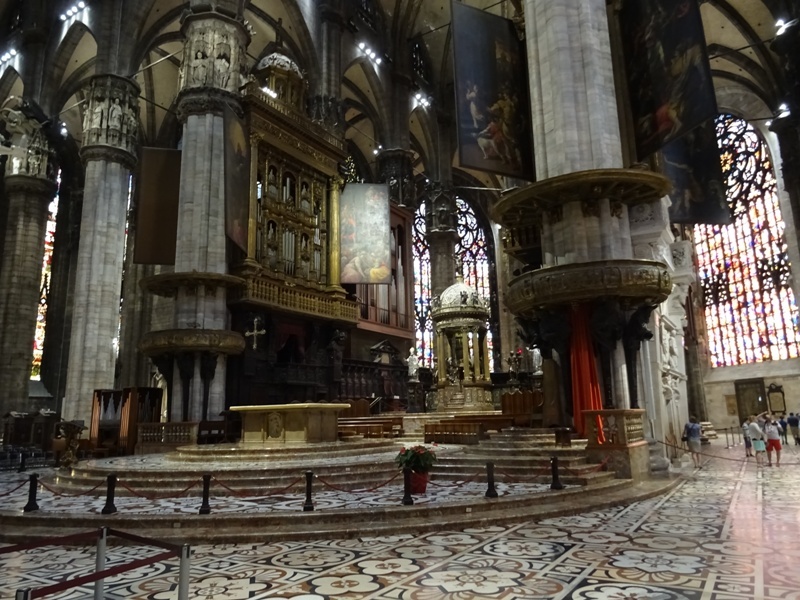 There is a lot to see inside the Duomo. This is an immense cathedral, with a nave and four aisles. All the columns are decorated with statues of various saints. 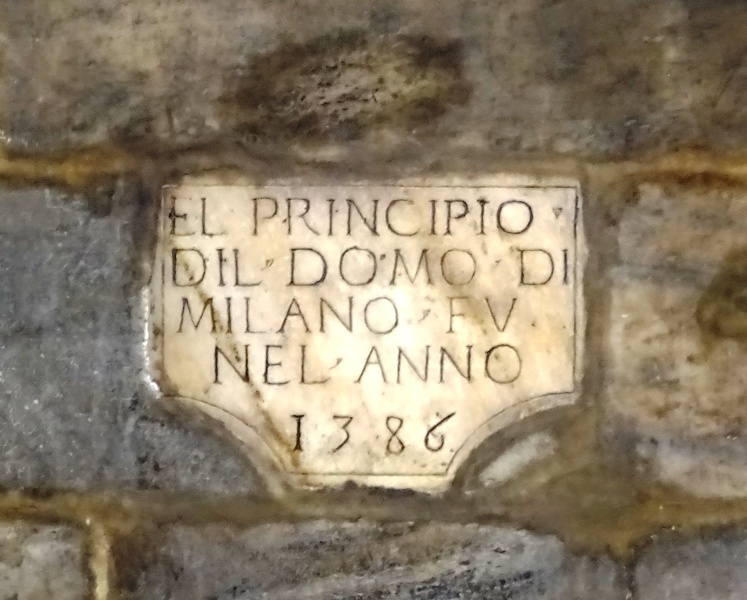 In the right aisle, we find a plaque with the text EL PRINCIPIO DIL DOMO DI MILANO FV NEL ANNO 1386, commemorating the founding of the cathedral in that year. Unfortunately, the left aisle seems to be accessible only for worshippers. That regretfully meant we were unable to admire the famous Trivulzio Candelabrum in the left transept. This huge bronze candelabrum, which is over five metres high, has been in the Duomo since 1562. Its origins are somewhat shrouded in mystery. The object is sometimes attributed to the goldsmith Nicholas of Verdun (1130-1205), but this attribution is anything but certain. The candelabrum has its own page on Italian Wikipedia, with a good picture. The Duomo is famous for its stained glass windows. The oldest of these date back to the early fifteenth century, while the newest was made in 1988. The differences in style are hard to miss. I especially liked the window in the right aisle from 1470-1475, showing scenes from the Life of Christ, as well as some of the sixteenth century windows in that same aisle with scenes from the Old Testament. In the right transept we can find a window with scenes from the Life of Saint Catherine of Alexandria, which was designed by Biagio and Giuseppe Arcimboldo (1526-1593), father and son. For Saint Catherine’s story, see Milan: San Nazaro in Brolo. The apse windows have already been mentioned above. There are three of them. 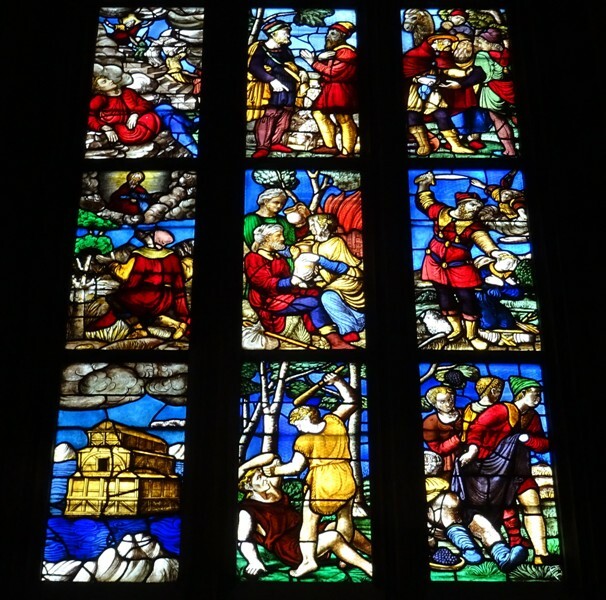 The left window has scenes from the Old Testament, while the right window shows scenes from the New Testament. The centre window is about the Apocalypse. The apse is the oldest part of the cathedral, but the original window panes have mostly been replaced. The left and right window can be dated to the nineteenth century. They are the work of Giovanni Battista Bertini and his sons Pompeo and Giuseppe, who was then director of the Brera Gallery and would become the first director of the Museo Poldi Pezzoli. According to the Duomo website “Giovanni Battista Bertini and his sons worked using a new technique, that of enamel decoration, based on the earlier model of historiated stained glass. The Bertini family made no less than eleven large stain glassed windows from scratch, including the two apse windows.” The central window, however, is special. About fifty of the panes are originals from the fifteenth and sixteenth century. Impression of the apse windows. Pellegrino Tibaldi’s sanctuary is quite impressive. Since it is roped off, you have to admire the altar, the wooden choir stalls, the organs and the huge baldachin from a distance. The sanctuary is flanked by two large gilded copper pulpits. Behind the sanctuary, opposite the sacristy, there is a flight of stairs leading down to the tomb of Saint Carlo Borromeo, the archbishop who was already mentioned above. We did not go down there. A flock of pilgrims was visiting the cathedral at that time and San Carlo’s tomb is a very important part of the visit for them. Do not forget to take a look at the funeral monument for Gian Giacomo Medici (1498-1555) in the right transept. He was the brother of Pope Pius IV (1559-1565), who was born in 1499 as Giovanni Angelo Medici. The Milanese Medicis were probably not related to their more famous namesakes, the Medicis of Florence. Although of fairly humble origins, Giovanni Medici, once pope, commissioned a splendid tomb for his deceased brother. The monument was once attributed to Michelangelo, but it is now accepted that it was actually the work of the sculptor Leone Leoni (ca. 1509-1590) and made between 1560 and 1563. The monument has its own page on Italian Wikipedia, which suggests that the tomb was in fact designed by Michelangelo. The most famous and at the same time the most gruesome statue of the Duomo can also be found in the right transept. I am referring to a statue of Saint Bartholomew, sculpted by Marco d’Agrate (ca. 1504-1574) in 1562. Bartholomew was one of the twelve apostles. 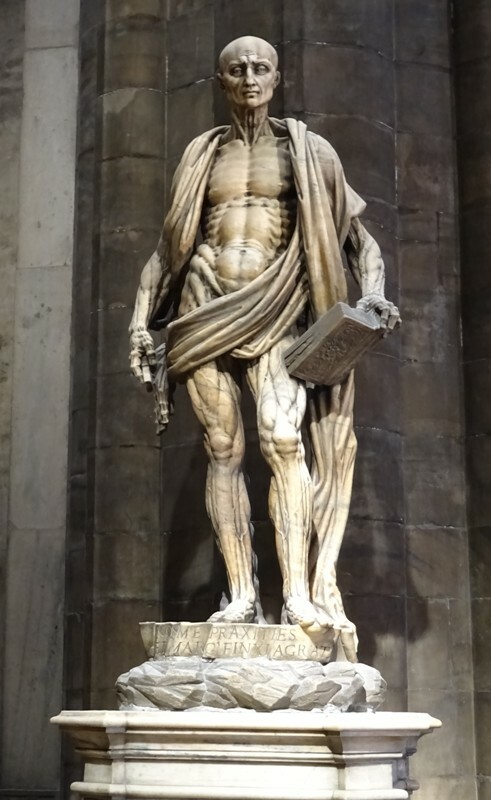 Church tradition dictates that he was flayed alive, and the statue shows him with the flayed skin draped over his shoulders like a Roman toga. 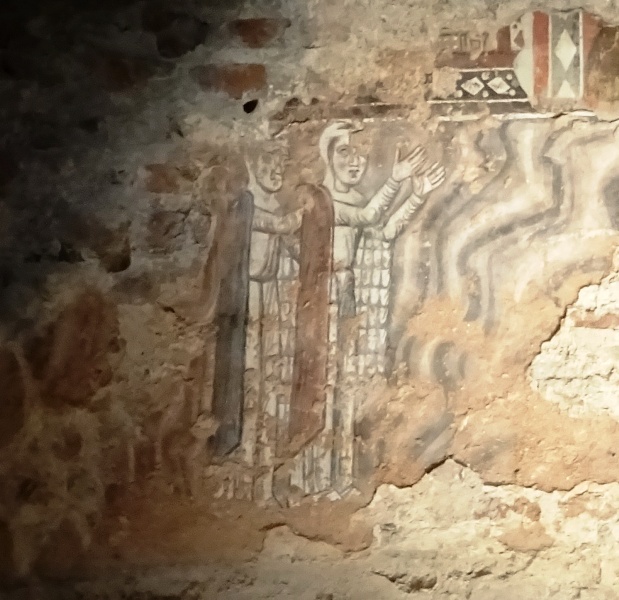 Faded fresco in the Baptistery. Do not forget to visit the remains of the Baptistery of San Giovanni alle fonti underneath the Duomo. This may have been the spot where Saint Ambrosius baptised Saint Augustinus of Hippo, although there is a rival tradition that claims that this event took place in the Sant’Ambrogio, elsewhere in Milan. The Baptistery was demolished in 1394 to make way for the new cathedral. I have to admit there is not that much to see down here. The contours of the octagonal baptismal font are still visible, and the visitor can also see the remains of the apse of the basilica of Santa Thecla, demolished in 1461 (see above). If you look closely, you should be able to spot two figures in a largely faded and damaged fresco. They seem to be participants in a baptismal ceremony. It is possible to take the stairs or one of the two elevators to the terraces of the roof of the cathedral. There is only room for about five people inside the elevator, and when we visited Milan in August 2016, one of the elevators was undergoing repairs, so there was a long queue. The view from the terraces is pretty good, although one has to keep in mind that Milan is not Rome or Florence. The city has a much more modern skyline, but you should still be able to see older landmarks such as the San Gottardo in Corte, the San Lorenzo Maggiore and the Castello Sforzesco. The Galleria Vittorio Emanuele II, built between 1865 and 1877 by Giuseppe Mengoni (1829-1877) is visible as well. Sometimes the view is blocked, either by the facade or by one of the many pinnacles, arches or statues. According to the Duomo website, there are 135 spires and pinnacles, as well as 3.400 statues that adorn the exterior and interior of the cathedral. The most important statues have been moved to the Museo del Duomo and have been replaced by copies. 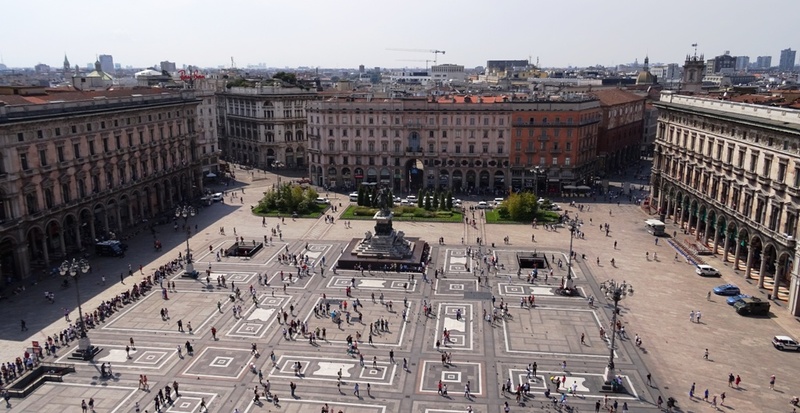 The Dorling Kindersley travel guide to Milan and the Lakes (2010) was an important source for this post. I also made use of the Duomo’s own website and the article about the Duomo on Italian Wikipedia.